'Hug This!' 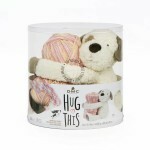 Puppy Dog baby blanket kit to knit with coordinating variegated, soft 100% acrylic, fine weight yarn. 100% polyester cuddly plush toy included. Packed in a clear protective plastic box, pattern included.